Sumalak, which was a tradition among the ancient Turkish tribes who lived in Central Asia, is a favorite dish of the people of Central Asia during the holiday of Navruz. According to Makhmud Koshkari, the great linguist, who lived during the 11th century, Suma, which means swollen wheat, comes from an old Turkish word. The wheat is put in water until it begins to sprout. Then it is dried and crushed into a paste from which bread is made. The bread is eaten with Ugra Oshi. Prayers are offered to the seven stones which are placed in the Sumalak, and agitated to keep it from burning. Sumalak is offered to brides who have no children. The bride wears an earring made of wheat grass in order to increase her fertility. During the celebration of the Sumalak, unmarried girls must pray to the seven stars. Old women plant new trees with young women who are not married. The old women put a boy on the bride's knees, in order to increase her fertility. Begin preparing seven to ten days in advance of the celebration. All participants in the making of the Sumalak must wash themselves carefully in advance of preparation. At the beginning of the seven to ten days, wash the wheat. Then put it in water on a plate, and let it sit for two or three days. Spread the seeds and cover them with gauze, and rinse it everyday three times with water. The wheat must be kept in a dark room at 16-18 degrees C0. (60-65 degrees F.). If the wheat is of light color, this may change. If the temperature is too low, the wheat will sprout slowly. If it is too warm the sprouts will wilt. To avoid mildew under the wheat you should tilt the table so the wheat isn't sitting in the water. With this treatment, after two days, it will begin to sprout. Remove the gauze from the sprouted wheat. Put it on a clean table and separate it according to size. The sprouts must be no longer than one and a half centimeters. you lift the sprouts they are tangled together. you crush them in your fingers and they crumble. After seven days put the sprouts in a bowl, cut them in strips and crush them. Then put them through a meat grinder, and rinse through gauze three times, using the three buckets of water. All the sweet juices of the wheat will be in the water. Then squeeze the pulp to get out the remaining juices. The first bucket of water must look like milk. The second and the third will not be as white. Put the first bucket of water in a pot, and then add 4 kilos of white flour. Stir, stir, stir until there are no lumps. Heat 900 grams of oil for each kilo of wheat. (Fry some dough in the oil to clarify it.) Add the oil to the wheat and turn on the heat. After it boils, add the second bucket of water, and after that water boils put in the third. The seven little stones in the bottom of the pot, as it is stirred, will keep the sumalak from burning. As it boils, it will thicken, but stir continually. It must boil for 13 or 14 hours. After 5 hours the color will begin to change. If it becomes too thick, add water. After this put it on medium heat and continue stirring. The Sumalak will be ready when it is thick. This usually happens after about 14 hours of stirring. There will be foam, the oil will have separated to the top, and the color will be a rich brown. Before partaking of the Sumalak, you should read the Koran, and stir it once more. An old man or an old woman must taste it, and then they will pass it on to friends. 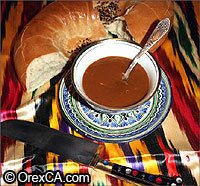 Sumalak is the food of Navruz and a meal of friendship.